Day 2 of our Japan trip. First thing in the morning – after our breakfast at the hotel restaurant, we went to Kyoto – about an hour’s bus drive. 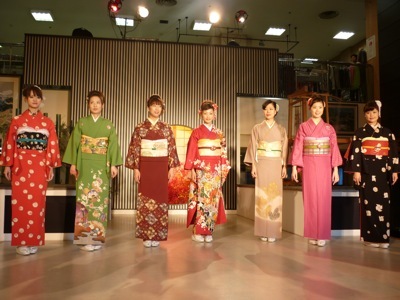 The first destination in Kyoto was Nishijin Textile Center (西陣織展覽館) – a place to showcase kimono. We caught the first Kimono Fashion Show at 10am (there are 6-7 shows a day from 10am to 4pm) and it lasted for about 15 minutes. It couldn’t be better as the show is free of charge. If you are interested, you can buy some kimono back home at its souvenir shop upstairs. 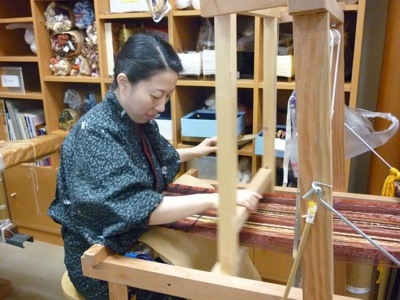 Or even try your hand at making a kimono. Interesting fact that I learned from the tour guide: To preserve Kyoto as an ancient city and encourage more women (especially the young ones) to wear kimono, the government has come up with a creative incentive. For those who wear kimono, they are entitled to a 10% discount on taxi fare if they move around in the city in the traditional Japanese costume. It is very attractive as taxi fare in Japan is unbelievably high.